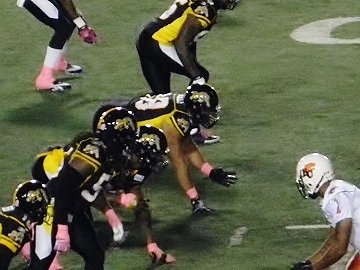 The Ontario Securities Commission (OSC) is seeking to slap a ban on former Hamilton Tiger Cat linebacker turned financial advisor, Mark Allen Dennis, preventing him from working in the securities industry after being twice convicted of defrauding his clients. Dennis's career in the Canadian Football League came to an abrupt end in 1993 following a knee injury, after which he began working as a financial advisor. He went on to found his own investment companies as the Dennam group but was convicted of stealing money from clients whose funds he was supposed to be investing. According to documents filed Tuesday by the OSC, the money given to Dennis by his clients would supposedly be invested in either commercial real estate or mortgages but he really kept for “his own personal use.” The victims included his own sister. In 2012 he was indicted on three counts of theft and found guilty on a single count for which he was sentenced to two years less a day in jail, followed by a two-year period of probation. Earlier this year he was sentenced to 37 months in prison for a $5m fraud. But Dennis has since filed for bankruptcy, claiming that all of his family’s property has been sold and all his investment accounts are frozen. According to the filing, the OSC is seeking to have him permanently banned from trading securities, registering as an investment fund manager or promoter, and acting as an officer or director. In 2011 Dennis was banned from becoming a registrant with the Investment Industry Regulatory Organization of Canada. A hearing is due to take place October 27 at the OSC’s headquarters in Toronto.